Small but active and alert, the Tibetan Spaniel dog breed hails from mountainous Tibet, where he served as a companion and watchdog. He’s known for his intelligence, easy-care coat, and his desire to keep watch over his family from high perches in the house. See below for complete list of Tibetan Spaniel characteristics! The Tibetan Spaniel is a small dog with a long history. Bred in Tibetan Buddhist lamaseries to be companions and alarm dogs, they were popular gifts to foreign dignitaries. Today the little canine ambassadors are still prized as companions, thanks to their sweet, smart, and attentive nature. Said to resemble a little lion, a powerful Buddhist symbol, he retains the watchfulness bred into him centuries ago and can be aloof toward strangers, but he's a fond and friendly family companion. Tibbies, as they're nicknamed, are active enough to enjoy dog sports such as agility, but not so demanding of exercise that they'll run you ragged. Their portable size makes them suited to any home, from apartment to estate, as long as they have plenty of human attention. When they're not cuddling with their people, Tibbies enjoy a high perch that allows them to see everything that's going on. They'll climb on whatever piece of furniture gives them the best view, giving them the reputation of being catlike. Like many small dogs, they prefer being approached at their own level rather than having someone looming over them. They're highly intelligent and take well to training when it's accompanied by positive reinforcement techniques such as praise, play, and food rewards. Tibetan Spaniels are sensitive to the moods and needs of their families and they're happy to try and meet them. This loving breed is uncommon, but he's the ideal match for the right homes. The Tibetan Spaniel is an ancient breed from Asia. Depictions of small dogs with pushed-in faces and lionlike coats date back centuries in China and Tibet. It's believed that Buddhist monks, known as lamas, bred the little dogs to sound the alarm if anyone approached the lamasery. With the ruff of thick fur around their neck and the richly plumed tail, they were said to resemble little lions. In Buddhist symbology, lions represent Buddha's triumph over violence and aggression, so dogs with a lionlike appearance were popular. The dogs were frequently given as gifts to ambassadors and other notables, with dogs from those countries being received in return. Thus the Tibetan dogs made their way to the courts of China and Japan, where they no doubt interbred with other small Asian dogs. Today's Tibetan Spaniel probably shares a common ancestry with the Japanese Chin and the Pekingese. Often bred by Tibetan villagers as well as lamas, early dogs of this type came in a wide range of sizes. The smallest, most prized puppies were given to the lamaseries where they were probably bred with the more elegant dogs that arrived as gifts from China. During the late 19th century, the first Tibetan Spaniel was brought to England by Mrs. McLaren Morris. More arrived in the 1920s, courtesy of Dr. Agnes R. H. Greig, who sent some of the dogs to her mother. The breed gained some popularity, but its foothold in England was almost completely wiped out during World War II. In 1947, after several successful breedings and importations, the breed began to recover in England. In 1958, The Tibetan Spaniel Association was formed and in 1960 England's Kennel Club recognized the breed. The first known litter in the United States was born in 1965, to parents imported from Tibet by a Mr. Harrington. Thanks to Leo Kearns, sexton of Trinity Lutheran Church in New Haven, Connecticut, the Tibetan Spaniel began attracting notice. Kearns had a Tibbie puppy, and his parishioners were quite taken with her. He imported a male, and the puppies the two dogs produced were soon placed in doting homes. Among those enthusiastic new owners was Mrs. Jay Child, who made it her mission to see the breed established in the U. S. The Tibetan Spaniel Club of America was founded in 1971, with Child as president. The American Kennel Club recognized the breed in 1984. Despite his charm, the Tibetan Spaniel is still pretty rare, ranking 101st in popularity among the breeds and varieties registered by the American Kennel Club. Tibetan Spaniels stand about 10 inches high at the shoulder and weigh 9 to 15 pounds. Tibetan Spaniels are generally healthy, but like all breeds, they can get certain conditions. Not all Tibetan Spaniels will get any or all of these diseases, but it's important to be aware of them if you're considering this breed. In Tibetan Spaniels, you should expect to see health clearances from the Orthopedic Foundation for Animals for patellas (knees) and from the Canine Eye Registry Foundation (CERF) certifying that the eyes are normal. Progressive Retinal Atrophy (PRA) is a degenerative eye disorder. Blindness caused by PRA is a slow process resulting from the loss of photoreceptors at the back of the eye. PRA is detectable years before the dog shows any signs of blindness. A reputable breeder will have their dogs eyes certified on a yearly basis. Patellar Luxation, also known as "slipped stifles," this is a common problem in small dogs. It is caused when the patella, which has three parts — the femur (thigh bone), patella (knee cap), and tibia (calf) — is not properly lined up. This causes lameness in the leg or an abnormal gait, sort of like a skip or a hop. It is a condition that is present at birth although the actual misalignment or luxation does not always occur until much later. The rubbing caused by patellar luxation can lead to arthritis, a degenerative joint disease. There are four grades of patellar luxation, ranging from grade I, an occasional luxation causing temporary lameness in the joint, to grade IV, in which the turning of the tibia is severe and the patella cannot be realigned manually. This gives the dog a bowlegged appearance. Severe grades of patellar luxation may require surgical repair. Tibbies are housedogs. They thrive on spending time with their people, and they're not suited to living outdoors or in a kennel. 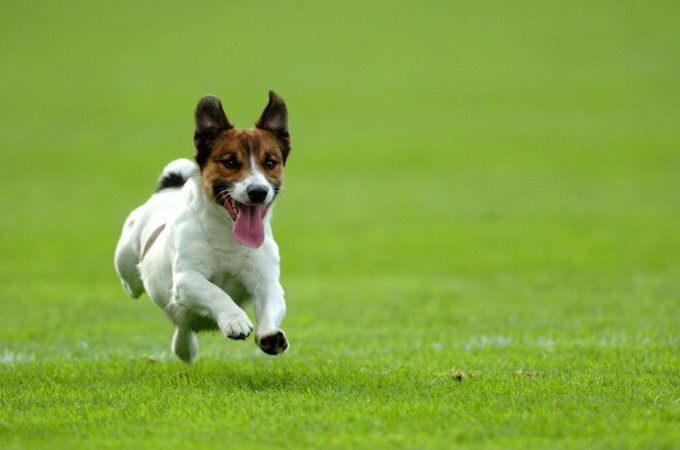 Because they may run off to explore, yards must be fenced and they should be walked on leash. Intelligent and willing to please, Tibetan Spaniels can be easy to train, but that doesn't necessarily mean they'll always listen to you. They have a mind of their own and will ignore commands if they don't feel like obeying. For best results, begin training early and be consistent. Some Tibetan Spaniels are yappy and some aren't, but they'll generally bark when someone comes to the door or when they hear or see anyone or anything unusual. With patience and consistency, you can teach them to stop barking after they've briefly sounded the alarm. If you live in an apartment with noise restrictions, however, this may not be the breed for you. Like all dogs, the Tibetan Spaniel needs reguar exercise, but he doesn't need a ton of it. Usually a good playtime in the backyard or one or two walks in a day will fit the bill. Tibetan Spaniels are generally easy to housetrain, but crate training is strongly recommended. It will make housetraining easier and keep your Tibetan Spaniel from chewing things while you're not there to supervise. The crate is a tool, not a jail, however, so don't keep your Tibetan Spaniel locked up in it for long periods. The best place for a Tibetan Spaniel is with you. Recommended daily amount: 3/4 to 1 cup of a high-quality dog food daily, divided into two meals. Keep your Tibetan Spaniel in good shape by measuring his food and feeding him twice a day rather than leaving food out all the time. If you're unsure whether he's overweight, give him the eye test and the hands-on test. First, look down at him. You should be able to see a waist. Then place your hands on his back, thumbs along the spine, with the fingers spread downward. You should be able to feel but not see his ribs without having to press hard. If you can't, he needs less food and more exercise. For more on feeding your Tibetan Spaniel, see our guidelines for buying the right food, feeding your puppy, and feeding your adult dog. 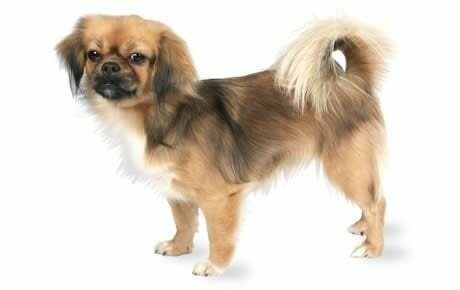 The Tibetan Spaniel has a silky double coat that's smooth on the face and the front of the legs and moderately long on the rest of the body. The ears, tail, and backs of the forelegs and buttocks have longer hair, and a mane of long hair (sometimes referred to as a shawl) surrounds the neck. The Tibbie's coat can be any color or mixture of colors. Weekly brushing will keep your Tibetan Spaniel's coat free of loose hair. Expect them to shed small amounts year-round, with a heavier shed once or sometimes twice a year. Bathe them as needed, usually every 6 to 8 weeks. Other grooming needs include dental hygiene and nail care. Brush your Tibetan Spaniel's teeth at least two or three times a week to remove tartar buildup and the accompanying bacteria. Daily is better. Trim his nails once or twice a month, as needed. If you can hear the nail clicking on the floor, they're too long. Short nails keep the feet in good condition, don't get caught in the carpet and tear, and don't scratch your legs when your Tibetan Spaniel enthusiastically jumps up to greet you. Start grooming your Tibetan Spaniel when he's a puppy to get him used to it. Handle his paws frequently — dogs are touchy about their feet — and look inside his mouth and ears. Make grooming a positive experience filled with praise and rewards, and you'll lay the groundwork for easy veterinary exams and other handling when he's an adult. Tibetan Spaniels are sometimes bought without any clear understanding of what goes into owning one, and these dogs often end up in the care of rescue groups, in need of adoption or fostering. Other Tibetan Spaniels end up in rescue because their owners have divorced or died. If you're interested in adopting an adult Tibetan Spaniel who's already gone through the destructive puppy stage and may already be trained, a rescue group is a good place to start.